Yellow skinned when ripe this mango is grown in South Africa and a few other African countries. Heidi mango is very sweet with a slightly fibrous flesh. This is a mid to large sized mango and its skin is yellowish red when ripe. 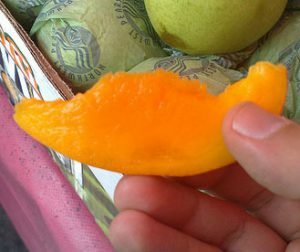 The shape of the mango is said to resemble a heart and it has a unique mango flavor. Generally available during the months of February and March.